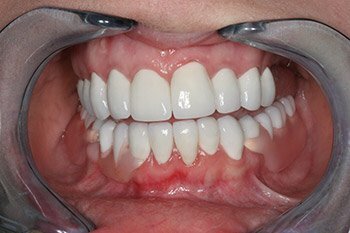 Crown and bridge work is a time tested treatment to strengthen teeth, replace missing teeth and enhance your smile. 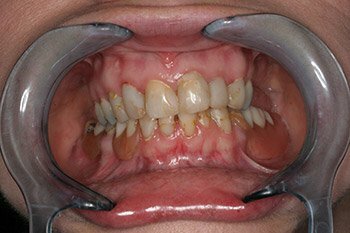 A protective covering or “cap” that is cemented over the remaining structure of a broken or severely decayed tooth. There by restoring the tooth to its original shape, size and strength. A sequence of crowns connected to one or more fake teeth to replace missing teeth is a bridge. 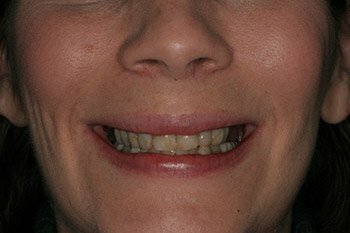 Crowns and bridges together can greatly enhance the appearance of one’s smile by replacing missing teeth and by improving the color and alignment of the remaining teeth. As seen in the photos below, the improvement can be very dramatic. 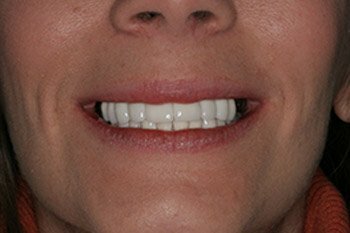 This patient had all of her existing teeth strengthen with crowns by Dr. Meiss.